Home / Posts tagged "Pennsylvania"
A group of individuals gathered on Union Street in Trenton and turned it into a scene of gunfire that left 4 people shot and one child injured after being struck by an assailant fleeing on a dirt bike. 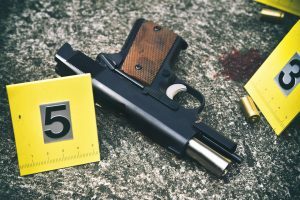 Though the crime rate in Trenton has has had a downward trend for the past 18 years, and that trend is expected to continue through 2018, Trenton has been the scene of several shootings in the recent past. This latest incident could leave the accused facing several criminal charges and even involve a personal injury claim for the child who was struck in an attempt to get away from danger by fleeing suspect(s). The skilled lawyers at Kamensky Cohen & Riechelson have served our clients in Trenton, Princeton, Lawrence, Hamilton, New Brunswick, all over Mercer County and North Philadelphia in both types of cases, Personal Injury and Criminal. If you or someone you know has been injured due to the criminal act of another, the law recognizes not only criminal penalties but allows one to seek civil action to receive compensation for your injuries whether they be physical or emotional. Our dependable lawyers have significant experience handling personal injury claims for clients across New Jersey and Pennsylvania. If you or someone you know has been arrested on weapons charges, drug charges, domestic violence, or any other criminal offence, Kamensky Cohen & Riechelson is the law firm with the experience you need in your corner. According to police four people were wounded and a child was struck by a dirt bike during a shooting in Trenton on Saturday night. The injuries ranged from minor to serous with alt least one of the shooting victims in critical condition. Trenton Police Lt. Stephen Varn reported that a group had gathered at the end of Union Street at about 8:30 when several dirt bikes and at least one ATV approached and began shooting. It is possible that at least some in the group returned fire. A woman and two men, none of whom were identified, were hit by gunfire and transported for treatment at Capital Health Regional Medical Center. A fourth victim managed to travel several blocks before collapsing. He was also transported to Capital and is listed in critical condition. As the group of perpetrators fled, one of them struck a 7-year old boy, who was attempting to flee the violence, with a dirt bike causing significant injuries to the child. Though the investigation is ongoing Varn reported that the authorities have already recovered two dirt bikes and a handgun. From a legal standpoint there are several possible charges waiting for these assailants when they are caught. Weapons charges, from illegally discharging a firearm in a public place to possession of a firearm for unlawful purpose will almost surely be among them. Furthermore there were several vehicle violations including reckless driving and leaving the scene of an accident. However the most serious charges they could be facing would be the several counts of attempted murder and reckless endangerment. The family of the 7-year old who was struck by the dirt bike would also be within their rights to pursue a personal injury claim and restitution against the driver of the bike that struck him. Restitution is the money a judge orders the offender to pay to the victims to compensate them for expenses related to the crime. Restitution can be ordered in both adult and juvenile cases as part of the offender’s sentence. It is important to note that an order of restitution does not preclude a victim from seeking a separate civil personal injury claim based on the same facts and events. It is for this reason one should consult a qualified and experienced attorney before agreeing to any settlement or restitution. If you or someone you know has been arrested for a criminal offense or suffered injury as a result of a crime or negligence, experienced and skilled counsel is critical. Having a qualified attorney to fight for you can make all the difference as it relates to your life and your freedom. The attorneys at Kamensky Cohen & Riechelson look forward to speaking to you about your unique circumstance and helping to guide you through a potentially difficult time. Contact us online or via phone in New Jersey at (609) 528-2596 or in Pennsylvania at (215) 337-4915. A Bensalem PA man was arrested after allegedly posing as a utility worker and stealing cash and jewelry from a residence in Evesham, Pennsylvania. Police said that the suspect gained access to the victim’s home on North Locust Avenue by pretending to be a utility worker. He reportedly told the homeowner that the house was having water problems and that the problems needed to be investigated immediately. After entering the house, the suspect allegedly stole more than $500 in cash, as well as several items of jewelry. According to authorities, the 31-year-old suspect committed the theft in November 2012. He was only recently identified as a suspect in the case because it investigators were using “advanced technology and investigative skills.” The investigators eventually placed the suspect at the scene of the theft. The suspect was tracked down at the Howard R. Young Correctional Institution in Wilmington, Delaware, where he is currently serving a prison term. The suspect now faces charges in Pennsylvania for third degree burglary and third degree theft. According to police, the suspect has a history of criminal activity in Pennsylvania. He was previously sentenced to three years of probation after pleaded guilty to being involved in a home-improvement scam which targeted elderly homeowners. Police in Hopewell NJ arrested a local man who allegedly used fake checks to pay for multiple taxicab rides. The 63-year-old suspect is accused of first giving a bad check to a cab driver in early November. The driver reportedly picked up the suspect in Montgomery Township and then took him to Hopewell. According to authorities, the driver dropped off the suspect at the suspect’s residence North Greenwood Avenue. A few weeks later, the suspect allegedly passed off another bad check to pay for a cab ride. This time, the suspect reportedly took a taxi from Doylestown PA to his Hopewell residence. According to police, the cab driver sensed that the check might not be good. However, the suspect allegedly ran inside his house and later refused to answer the door when the driver inquired about payment. The suspect was eventually arrested and charged with multiple counts of theft of services. If the suspect is convicted on either count, he could incur significant penalties. As set forth by N.J.S.A. 2C:20-8, the penalties for theft of any kind of transportation service can include prison time. Additionally, the suspect could be ordered to pay restitution to the victims.